lack or loss of ability to see (see vision). Legally, blindness is defined as less than 20/200 vision in the better eye with glasses (vision of 20/200 is the ability to see at 20 feet only what the normal eye can see at 200 feet). A person with 20° or less vision (pinhole vision) is also legally blind. In 2002, the number of people classified as legally blind in the United States was estimated at 10 million; millions more had severe visual impairments. The five leading causes of impaired vision and blindness in the United States are age-related macular degeneration, cataract, glaucoma, diabetic retinopathy, and atrophy of the optic nerve. Besides health care problems, issues related to employment, independent living, and literacy should all be considered when caring for patients who are blind. The American Foundation for the Blind is a resource center for information related to visual problems. They can be contacted by calling 1-800-232-5463 or consulting their web site at http://www.afb.org. blue blindness (blue-yellow blindness) popular names for imperfect perception of blue and yellow tints; see tritanopia and tetartanopia. color blindness color vision deficiency. complete color blindness monochromatic vision. green blindness imperfect perception of green tints; see deuteranopia and protanopia. legal blindness that defined by law, usually, maximal visual acuity in the better eye after correction of 20/200 with a total diameter of the visual field in that eye of 20°. night blindness see night blindness. object blindness (psychic blindness) visual agnosia. red blindness popular name for protanopia. red-green blindness (red-green color blindness) popular names for any imperfect perception of red and green tints, including all the most common types of color vision deficiency. See deuteranomaly, deuteranopia, protanomaly, and protanopia. snow blindness dimness of vision, usually temporary, due to the glare of the sun upon snow. total color blindness monochromatic vision. yellow blindness popular name for tritanopia. 1. Loss of the sense of sight; absolute blindness connotes no light perception. 2. Loss of visual appreciation of objects although visual acuity is normal. 3. Absence of the appreciation of sensation, for example, taste blindness. /blind·ness/ (blīnd´nes) lack or loss of ability to see; lack of perception of visual stimuli. blue blindness , blue-yellow blindness popular names for imperfect perception of blue and yellow tints; see tritanopia and tetartanopia . 1. popular name for color vision deficiency. flight blindness amaurosis fugax due to high centrifugal forces encountered in aviation. legal blindness that defined by law, usually, maximal visual acuity in the better eye after correction of 20/200 with a total diameter of the visual field in that eye of 20 degrees. letter blindness alexia characterized by inability to recognize individual letters. night blindness failure or imperfection of vision at night or in dim light. object blindness , psychic blindness visual agnosia. red-green blindness popular name for any imperfect perception of red and green tints, including all the most common types of color vision deficiency. See deuteranomaly, deuteranopia, protanomaly, and protanopia. snow blindness dimness of vision, usually temporary, due to glare of sun upon snow. the absence of sight. The term may indicate a total loss of vision or may be applied in a modified manner to describe certain visual limitations, as in yellow color blindness (tritanopia) or word blindness (dyslexia). Legal blindness is defined as best corrected visual acuity less than 20/200 in the better eye or marked constriction of the visual fields. (1) Lack of visual perception due to structural or functional defects, which can occur anyplace from the eyelids to the visual cortex. (2) An inability to perceive the parameters of a scene in the nominal visual field of a subject in the presence of adequate illumination. An inability to see effectively. See Blue color blindness, Legal blindness, Night blindness, Occupational blindness, Snowblindness, Transient monocular blindness. 3. Absence of the appreciation of sensation, e.g., taste blindness. Inability to see. The leading causes of blindness in the U.S. are age-related macular degeneration, diabetic retinopathy, and glaucoma. Blindness may be caused by diseases of the lens, retina, or other eye structures; diseases of the optic nerve; or lesions of the visual cortex or pathways of the brain. A small number of infants are born blind, but far more people become blind during life. In the U.S., blindness due to infection is rare, but worldwide diseases like trachoma and onchocerciasis are relatively common causes of severe visual impairment. In malnourished people, vitamin A deficiency is an important cause of blindness. A variety of free services are available for the blind and physically handicapped. Talking Books Topics, published bimonthly in large-print, cassette, and disc formats, is distributed free to the blind and physically handicapped who participate in the Library of Congress free reading program. It lists recorded books and magazines available through a national network of cooperating libraries and provides news of developments and activities in library services. Subscription requests may be sent to Talking Books Topics, CMLS, P.O. Box 9150, Melbourne, FL 32902-9150. Inability to remember the names of colors. Blindness due to lesions in the left and right occipital lobes of the brain. The eyes are still able to move, and the pupillary light reflexes remain, but the blindness is as if the optic nerves had been severed. The usual cause is occlusion of the posterior cerebral arteries. Transitory cortical blindness may follow head injury. An inaccurate term for functional blindness, i.e., blindness caused by psychological disorders rather than by demonstrable organic pathology. A degree of loss of visual acuity that prevents a person from performing work requiring eyesight. In the U.S. this is defined as corrected visual acuity of 20/200 or less, or a visual field of 20° or less in the better eye. In the U.S. there are about three quarters of a million blind people, and about 8 or 9 million people with significant visual impairment. A form of aphasia marked by an inability to understand the meaning of letters. The inability to recognize musical notes. It is due to a lesion of the central nervous system. A disorder in which the brain fails to recognize things even though the eyes function normally. Sight without recognition due to a brain lesion. Blindness, usually temporary, due to the glare of sunlight on snow. It may result in photophobia and conjunctivitis, the latter resulting from effects of ultraviolet radiation. An inability to taste certain substances such as phenylthiocarbamide. This inability is due to an autosomal recessive trait. In older adults, causes of carotid atherosclerosis include smoking, diabetes mellitus, hypertension, obesity, and hypercholesterolemia. When atherosclerotic plaques form within the carotid artery, they may ulcerate. The exposed endothelium within the artery becomes a focus of inflammation and blood clotting. Blindness occurs when tiny clots from the carotid arteries embolize to the ophthalmic arteries. Patients often describe a dark shade descending into the field of vision. At the same time they may have other stroke symptoms, e.g., difficulty with speech or weakness of the hand on the side opposite the affected eye. A patient who may have carotid atherosclerosis should begin taking aspirin or other antiplatelet drugs if these are tolerated. Blood pressure and lipid levels should be controlled. The patient should be referred for noninvasive evaluation of blood flow through the carotid arteries, e.g., ultrasonography. If the carotid arteries are significantly blocked, the patient and physician should consider the risks and benefits of carotid endarterectomy. Inability to see violet tints. 1. Inability to see. 2. Absence or severe loss of vision so as to be unable to perform any work for which eyesight is essential. The World Health Organization (WHO) defines blindness as the best corrected visual acuity of 3/60 (20/400) or less, in the better eye. Syn. ablepsia; ablepsy; amaurosis. colour blindness Sometimes this term is incorrectly used to cover all forms of colour vision deficiency, however mild or severe. See achromatopsia; defective colour vision; deuteranopia; monochromat; protanopia; tritanopia. congenital stationary night blindness Night blindness (nyctalopia) inherited as either autosomal dominant with non-progressive nyctalopia but normal daylight visual acuity and visual fields and presumed to be due to a defect in neural transmission between the rods and the bipolars in the retina, or autosomal recessive or X-linked with congenital nyctalopia, myopia, nystagmus and reduced visual acuity. See Oguchi's disease; fundus albipunctatus; hemeralopia; retinitis pigmentosa. cortical blindness Loss of vision due to lesions in the areas of both occipital lobes of the brain associated with visual functions. It may result from trauma or from a vascular disease (e.g. a circulatory occlusion caused by a stroke). A lesion in one occipital lobe may result in homonymous hemianopia, often with macular sparing. eclipse blindness Partial or complete loss of central vision due to a foveal lesion caused by fixating the sun without adequate eye protection. This condition is caused mainly by the infrared radiations from the sun. See actinic. flash blindness See actinic keratoconjunctivitis. hysterical blindness Blindness associated with an emotional shock, which occurs without a physical or organic cause. The patient has normal blink and pupillary responses and the fundus appears normal. A placebo therapy and/or psychological counselling may be required. legal blindness The definition varies from country to country. In the UK it is equal to either 3/60 (20/400) or worse; or 6/60 (20/200) or worse, with markedly restricted fields. motion blindness A very rare condition in which a patient is unable to process information about motion, although other visual functions are unimpaired. This is believed to be the result of damage to the middle temporal cortex (V5). See visual association areas. snow blindness See actinic keratoconjunctivitis. lack or loss of ability to see. Diagnosed in an animal on the absence of a menace reflex, walking into obstructions and failure to indicate awareness of a soundless movement in its visual field, e.g. a falling cotton ball or feather. toxic retinopathy in sheep grazing bracken; characterized by blindness, dilated pupils, poor pupillary light reflex, retinal degeneration. due to a lesion of the optic cortex; the pupillary light reflex still functions. Called also cortical blindness. defective vision in bright light. See also hemeralopia. occurs in a number of breeds of cattle in which there are several defects in the eyes including irideremia, microphakia, ectopia lentis and cataract. failure or imperfection of vision in conditions of diminished illumination; a characteristic of progressive retinal atrophy. blindness due to a lesion in the optical apparatus peripheral to the optical cortex, including lesions in the optic chiasma, optic nerve, retina, anterior and posterior chambers, lens and cornea. With the exception of obvious lesions in the eyeball this is characterized by dilatation of the pupil and absence of the pupillary light reflex. Q. Why is the color draining from my eyes?! When I was little I had rich shiny cobalt blue eyes! As I grew up they faded or just started to dim in color. Being partially blind you can see in my left eye the its a really light color and creamy instead of my deep blue color... Why does my eye color dim?! I didnt think going blind had anything to do with the color of my eyes changing... Or is it something else?! Please, and thank you! A. depends on your blindness, if it is caused by your cornea changing (corneal opacity)- it'll change your eye color to a cloudy white. it can also be caused by cataract. are those the reason of your blindness? Temporary cortical blindness following angiography. We can probably do without the concept of wilful blindness. Wilful blindness: a confused and unnecessary basis for criminal liability? The possibility of shared underlying neurological mechanisms for ToM delays and congenital blindness has received little scientific attention. Last year, health officials visiting Colombia verified the elimination of river blindness transmission, but recommended that surveillance continue and called on country officials to address the social determinants that lead to river blindness infection. We look forward to a time when river blindness is no longer depriving people of their sight"
Of course, there are some occupations in which colour blindness is a distinct disadvantage, where recognising colour codes could be an important safety factor, such as when driving cars or flying aircraft, for example. Colour blindness can be stationary or progressive in nature and can be linked to other eye conditions such as age related macular degeneration. While the blindness rate across the world is about 0. 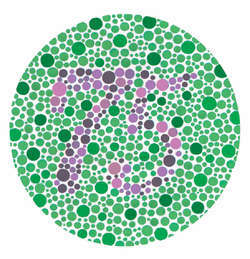 Predominantly colour blindness is an inherited condition and is more common in males than females. Of all eye ailments, cataract is the leading cause of blindness and its surgical coverage is globally recognised as a measure of progress towards national UHC. 21 crore children aged between six months to 59 months to prevent childhood blindness and reduce child mortality, reports BSS. 2 Million physicians of Indian-origin providing healthcare in nearly 100 countries of the world and together they can eliminate preventable blindness in children from the globe, said Dr VK Raju, Clinical Professor, Department of Ophthalmology at West Virginia University and Founder-President of The Eye Foundation of America in Morgantown, West Virginia.